← Yang Talk – Double Feature and Season Finale! The world is in crisis. Four diseases are spreading around the world and it’s up to you and your friends to stop the pandemic in this game that bears the same name. The four diseases are represented by four different colored cubes – red, yellow, blue, and black. Each city can have anywhere from one to three cubes of a particular disease. If a city would get a fourth cube of one color, instead it causes an outbreak which means you add one of that color to every connected city. If you’re in a really bad spot, one outbreak can even chain to cause others. But you’re not totally defenseless in the face of rampant disease. Each turn a player gets four actions with which they can turn back the tide. 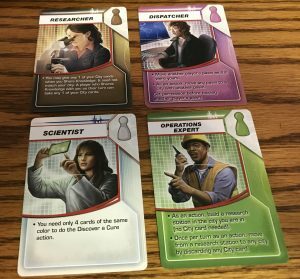 Those actions can be used to move from city to city, remove disease cubes from a city, cure a disease, build research centers, exchange player cards, or activate a player’s special ability. At the end of each turn, players draw two player cards for their hand and infect more cities. There’s a few ways you can lose in Pandemic. If you run out of any one color cube, you lose. If you get eight outbreaks, you lose. If the player deck gets down to zero, you lose. However, there’s only one way to win – you have to cure all four diseases. A disease is cured by playing five player cards of one color at a research center. If you’re able to cure all four, regardless of how many cubes remain on the board, you’ve stopped the pandemic. This is a great collaborative game. Most games are competitive, pitting you against your friends. This one pits you and your friends against the game and it makes for a fun change of pace. Pandemic comes with a scalable difficulty. Even at its most basic, this game is tough but you can adjust just how tough it is so that you aren’t discouraged or bored. 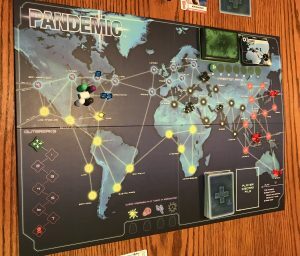 Pandemic does a great job with theme. It really feels like you’re dealing with a crisis and the roles all fit into how the world might respond to an international health crisis. The game has great replay value. You never get all the roles on your team at once and the combination of roles changes your strategy. The infection plays out at random, so your focus moves from game to game. Pandemic is good at mixing things up to keep you coming back. If you’re not careful, it’s easy for one player to dominate the game. Quieter people may get bulldozed by louder people in the collaborative process. Players that don’t press in as much may just get dragged along for the ride and that won’t make for a pleasant play experience. Bad luck can be fatal. Pandemic isn’t a very forgiving game and there are many ways to lose. Sometimes you’ll pay for your mistakes. Other times, you’ll pay for things you couldn’t do anything about. It can be impossible to overcome bad luck sometimes – and if you fail the whole world gets wiped out by disease. No big deal, right? Pandemicdoesn’t play well with two players. The game is set for two to four, but I wouldn’t play it with two. Less players will give you more time, but it gives you less roles to work with and I think roles are more important. 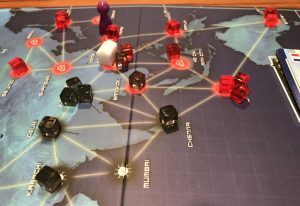 Pandemic really needs three or four players to get the best experience. Pandemic is one of my favorites. The collaborative design offers a different kind of challenge, pressing you and your friends to work together to find a solution. Some collaborative games can be too easy if you work together well. Pandemic, on the other hand, will give you a workout no matter what and that’s part of what makes it so fun. Pandemic is waiting for you! This entry was posted in Articles, Board Games, Review and tagged Board Game, Collaborative, Cooperative, Pandemic, Review, Tom. Bookmark the permalink.